If you are thinking of romantic ways to propose, the best thing you can do is have a proposal idea and plan it well. These top 25 most romantic marriage proposals will do just that. They are some of most creative, romantic and loving ways to propose to the one you love. 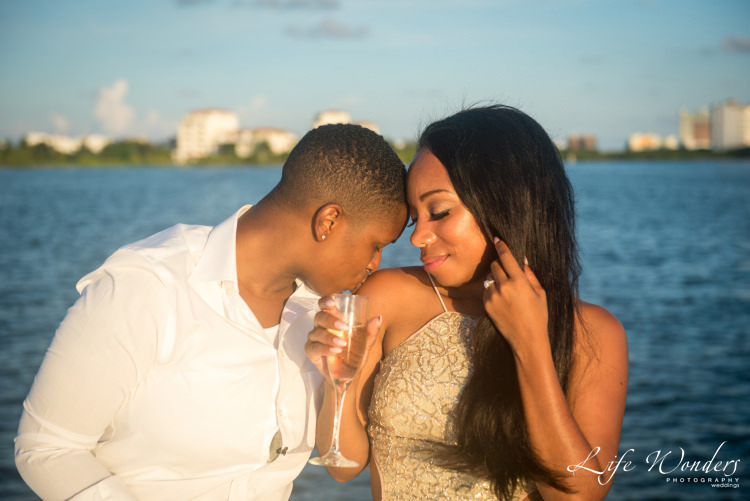 Joi and Nicole share an intimate moment after she says ‘Yes’ to the surprise marriage proposal. Proposing marriage is one of the most important things you will do in your life. Because of that, how you do it should match your personality as well as how special you want it to be. Whether you are looking for proposal ideas for men, proposal ideas at home or memorable proposal ideas, these top 25 have at least one for you. One of the most romantic ways to propose is a destination or a well planned engagement proposal getaway. Going away together is incredibly romantic. 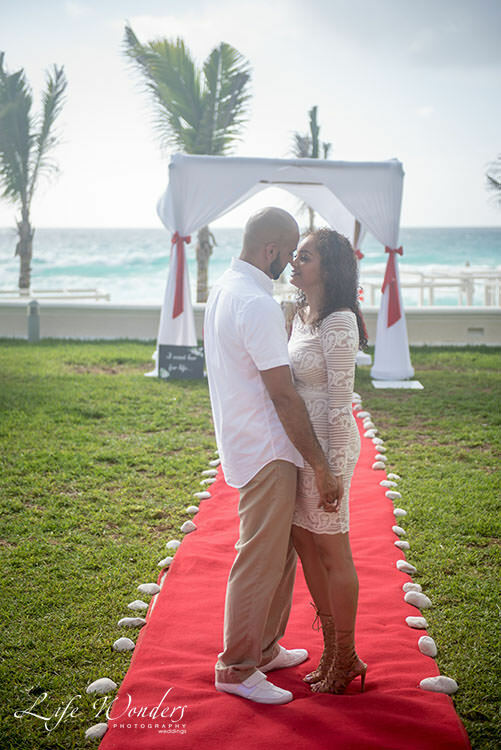 And choosing an exotic destination such as the Riviera Maya, can make even a simplest marriage proposal absolutely breathtaking. An added bonus is that all your activities will just seem like part of the vacation. So if you plan a fancy dinner, spa day, or beach picnic, your partner will not immediately assume you are planning to propose. Yes, she said yes…. Just look at her hand! To help get you started on the perfect marriage proposal, we have created this Ultimate Engagement Guide. It is complete with 25 of the most romantic ways to propose. We have also included a planning schedule, as well as extra tips to help you make your special ways to propose the best it can be. These marriage proposal ideas are guaranteed to make your loved one say yes. 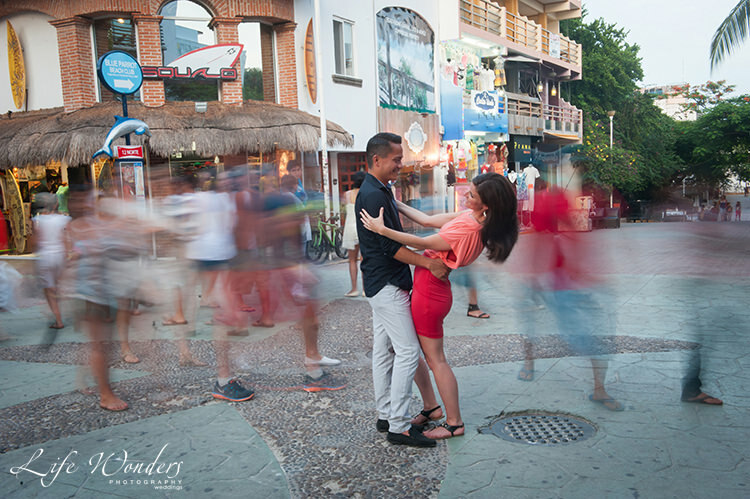 Remember, I have photographed many marriage proposals in the Cancun, Playa del Carmen and Akumal area If you have any questions, please do not hesitate to contact me as I would be thrilled to help out any way I can. Most of all, I would be very happy to answer any inquires you may have. The way you propose should be focused on you and your partner’s tastes and personality; make it a meaningful experience by tailoring it to what they like and dislike. Remember, the story of your marriage proposal will be told for years to come. With that in mind, have a look at some of my favorite engagement ideas and most romantic ways to propose below. A Beach wedding engagement is an incredibly romantic way to propose. I will make you appear as though you are on a secluded island.. I love how Angie and Johnny’s love is captured here with nothing in sight but the deep blue ocean. Many people think they have to find a secluded beach in order to propose. However, the many weddings I have photographed and experience has taught me that it is not always the case. Whenever you hire me to photograph your special marriage proposal, I will use some seasoned photography techniques. Doing so will allow me to make sure that the photographs show you both as the only two people on the beach! The beautiful ocean, and the intimate feeling of being the only two in the world, is the perfect scene to begin your lives together. Have a look at the these intimate feeling photographs of Angie and Johnny’s beach wedding engagement. The beach and romance are the perfect combination to bring lovers together. Live music can add a sentimental element to your marriage proposal. If you two already have a song, it can end up pulling on the heartstrings even more. 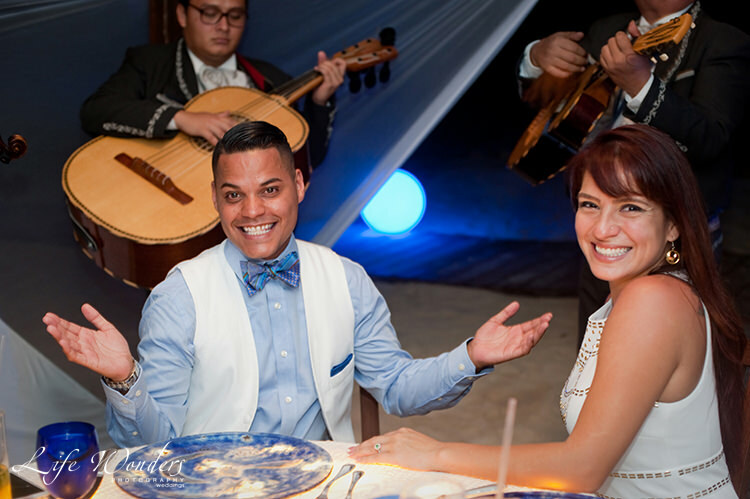 Eugenio succeeded in giving his fiance a surprise with this mariachi band. The mariachi was just another part of this beautifully planned marriage proposal. 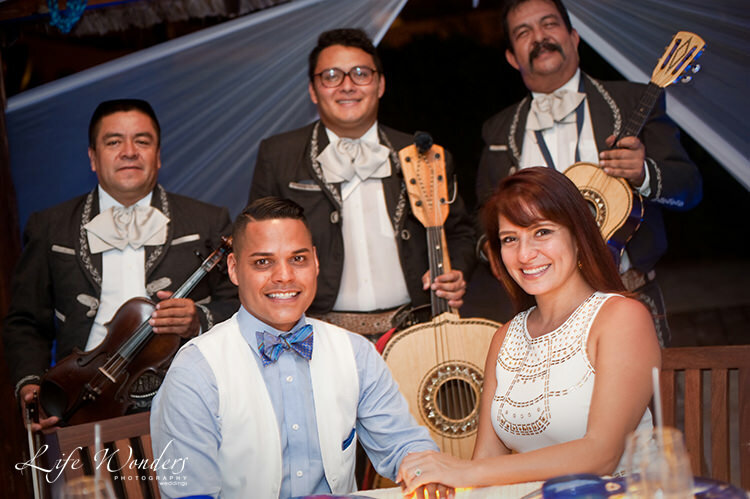 There’s plenty of musicians and mariachi bands for hire in Cancun. You can hire one for a surprise performance of your partner’s favorite love song – or any love song for that matter. You can do so on the beach or at dinner for your marriage proposal. 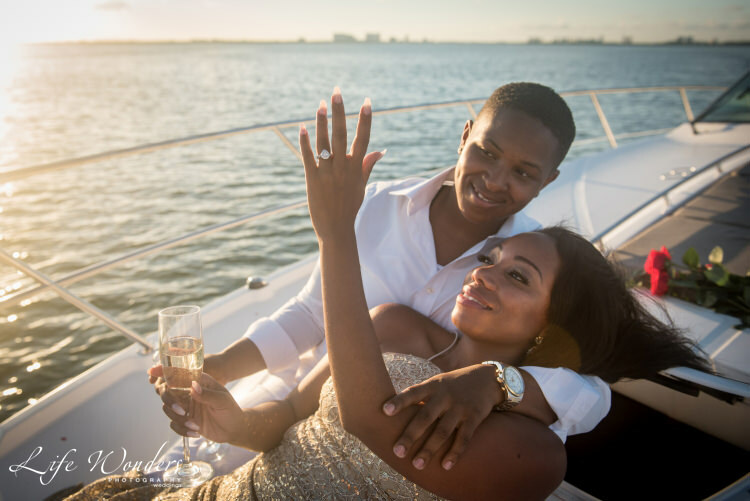 One of the most romantic ways to propose, is by either renting a boat or a yacht to do so. While this may be a bit too expensive for some, you can always hire a boat in the Riviera Maya area. (Contact me if you need help with this). We were lucky enough to see this happen when Joi did it for Nicole recently. We had the privilege to be there to capture it the entire beautiful and romantic moment. In fact, their romantic engagement turned out so well, that their story resulted in being featured on HowSheAsked.com. 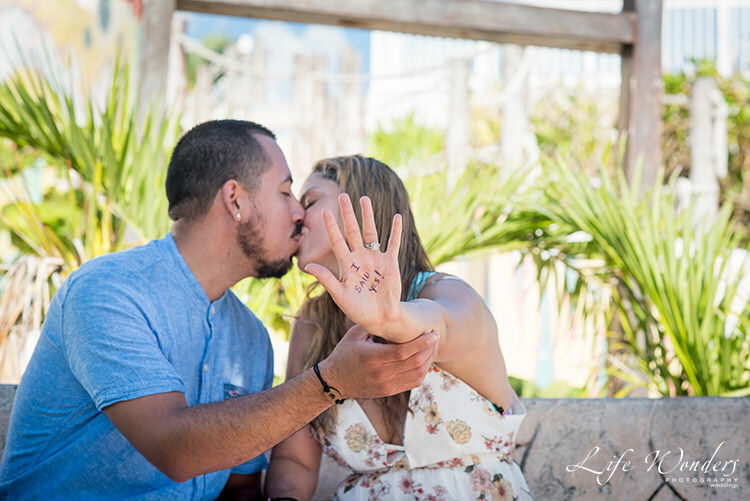 I was the photographer for this beautiful Cancun engagement. You can see Nicole’s surprise and excitement in every photograph. I love Joi’s expression as Nicole puts on the ring. And when you are ready to propose, I will be there to capture it all for you both. This is a moment none of us will forget. Nicole’s expression was priceless. It was very heartwarming for me to be there and capture it all. Are you planning on taking a trip with her friends and family? If so, then consider involving them in the planning process. They can even help with the actual marriage proposal, or the she-said-yes after party. Keep in mind that I only recommend this if you know you can trust them with the secret though — After all, you don’t want your carefully planned matrimonial proposal to be ruined due to a chatty family member. Send her on a scavenger hunt that ends with a romantic proposal. This is considered one of the top most creative proposal ideas around. Start with a clue at your hotel, and then lead your fiance-to-be through a tour of the hotel grounds. You can also do so around the beach, or even just inside your room. Include small gifts, flowers, or personalized notes with each clue along the way. This will help to stir up special memories that you two have created during your entire relationship. Photography Considerations: I love this idea! 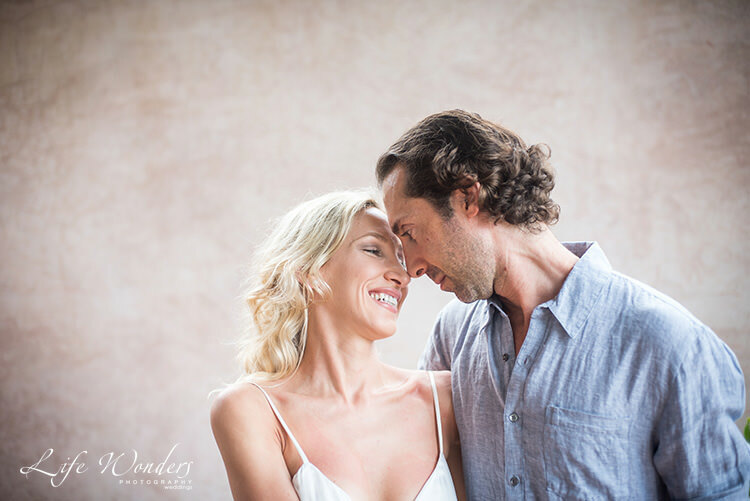 I have helped couples capture beautiful moments of their fiance searching through the resort grounds, them laughing and playing and eventually capturing her surprised expression when she finds the ring box and a rush of emotion comes over her face. Does she love to go out and dance? Take her dancing, and ask the DJ to dedicate a song to her before you propose on the dance floor. Love is in the air and this couple is oblivious to everyone else… except each other. Since knowing what to say when you propose is very important, you can take the time to have your thoughts already written out. If you are bold enough, you can even have them read some of your thoughts or feelings out loud. Or you can see if they let you do it yourself. There are many places you can go. But in order to make things less difficult, ask the Concierge of your hotel to help you choose a good spot. Remember to do this prior to arriving or as soon as you arrive. If you have time, it would be wise to visit their suggestions on your own one evening. Just make sure your partner doesn’t suspect anything. The Riviera Maya offers plenty of chances to rent a scooter, tandem bicycle, or Vespa. Take your partner out on a day trip and surprise them with a marriage proposal while overlooking the ocean. That heart pounding and breathtaking moment when the man of your dreams gets on one knee to propose in a magical beach setting. The islands off the coast, such as Isla Mujeres or Cozumel, are surrounded by gorgeous bluffs with amazing views of the ocean. The drive down the coast from Playa del Carmen to Tulum also has numerous idyllic beaches and views overlooking the deep blue of the Caribbean Ocean. Contact me and I can help you set up a beautiful beach wedding engagement day trip. Photography considerations: Have your photographer capture the two of you riding on a scooter up a cliff road. You can have the ocean in the background and the two of you smiling and enjoying the day together. This is one of the best ways to get some amazing proposals photos. 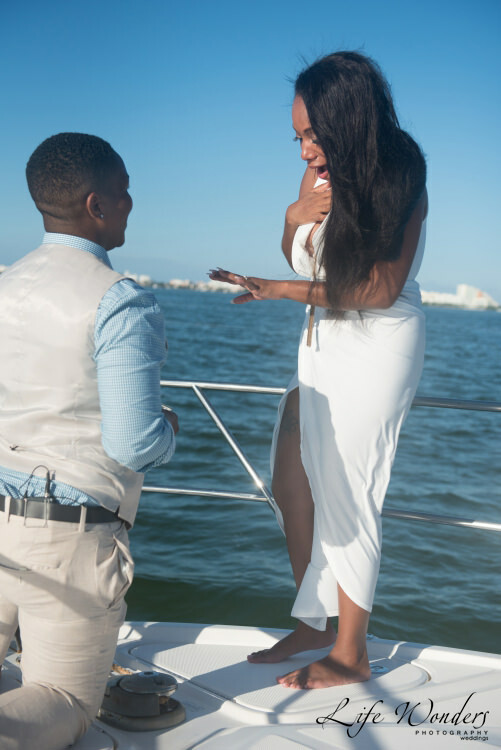 Joy and happiness are captured in this beautiful and romantic marriage proposal moment. Tell your partner that you have hired a photographer for a couples photo session, then surprise her with a marriage proposal. The priceless look on her face will be captured forever. In addition, you will also have some great photos to share. Photography Considerations: Discuss with your photographer possible locations for the photo session. Some locations have great spots to help you naturally create a wonderful surprise proposal moment. For example, if there is a small pier off the beach, your partner could be standing on the pier as you jump off, look up to him or her and propose. 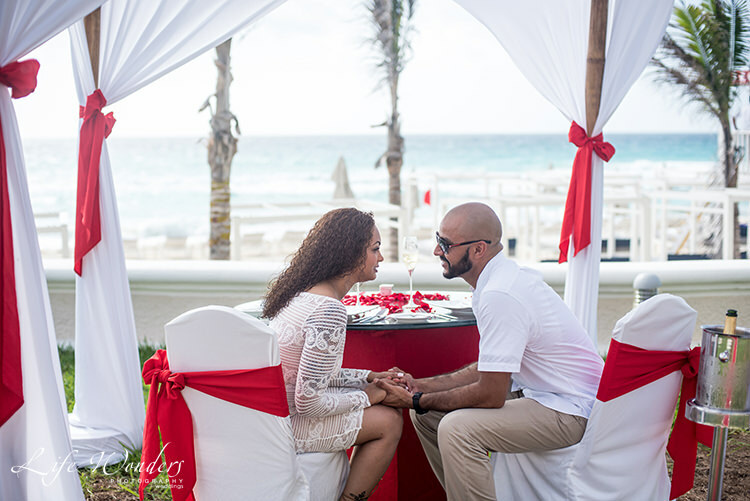 If you are in the Caribbean, there is no better way to enjoy your vacation than by declaring your love with a beach wedding engagement. Pack a picnic and make your marriage proposal over champagne and strawberries. Does she love stargazing? Go to the beach with a blanket, some candles, and wine. The night sky filled with stars is a dramatic backdrop for a dreamy marriage proposal. If you are staying at a beach resort, you can suggest going for a walk after dinner and find a nice quiet spot to propose. And if you both are a little daring, then maybe you can take a clandestine dip afterwards to celebrate your beach wedding engagement. Want another one of the most unique proposal ideas around? 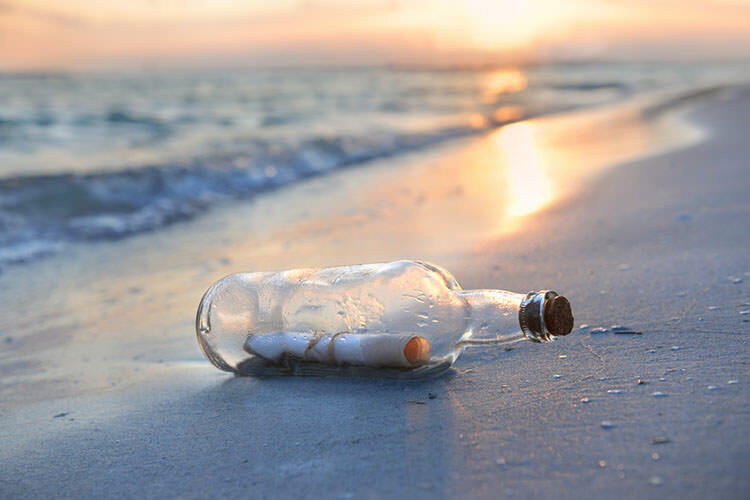 Then send your proposal for marriage to your fiance in a message in a bottle. Write out your marriage proposal on a piece of paper. Just be sure to make it look old by crumpling it, burning the edges, or rubbing it with dirt. Roll it up and place it in a bottle. Then, while you are at the beach, bury it in the sand. But be certain to keep it obvious enough so that he or she can find it. If not, then you may just have to find it for him or her. Whenever they pull out the message and begin reading it, be ready and break out the ring. Tip: Always keep the ring with you, as it can be easy to lose and also be easy for your partner to discover. Make sure you never leave it out in the open or somewhere obvious for them to find it. Planning Considerations: beach, adventure, plan ahead. A genie in a bottle could never provide as much magic as a marriage proposal in a bottle. If you want one of the most romantic and heart-stopping outdoor proposal ideas around, write your marriage proposal in the sky. Hire a small airplane to write out your marriage proposal with smoke, or pull a sign behind it with your question. This dramatic, super-visible, and romantic way to propose lets the whole world know that you want to spend the rest of your life together with him or her. Tell her you want to spend the day at the beach. Once you are there relaxing and enjoying the day, point up to the sky and ask her, “What do you think about these sky writers?”. There is no doubt, once she reads the message, your fiance will only say, “Yes” to you! Plan an evening out at a fancy restaurant or talk to your resort. Many of them have private areas for romantic evenings. You can also walk out your room or onto the beach, until the table is all set up. Call ahead to order champagne and extra flowers for your table. Candlelight, good food, and an intimate atmosphere is natural recipe for romance. Make it even more romantic by having a private dinner on the beach; check out how Eugenio, while at the Ritz Carlton in Cancun, did it here. Planning Considerations: Plan ahead, ask for hotel help as well as a tour guide, flowers and evening marriage proposal. If your partner loves horses or is interested in riding one, this is a way to make your beach wedding engagement fairy-tale perfect. Depending on what they like, you can set up a short or long ride. Talk to the tour operator about your marriage proposal idea. Perhaps they may be able to suggest a nice, secluded area along the trail for you to stop and propose. You can also choose a beach ride or a jungle trip. Get a couple’s massage at a day spa with the works—candlelight, low music, and total relaxation. Once you both feel spoiled, indulge her even more by asking for her hand in marriage. Many resorts have spa services available, so be sure to talk to the concierge and reserve ahead of time. Ask if they have private couple rooms and your romantic marriage proposal is well on its way. Pamper each other with a very relaxing and stress relieving spa. This will end up making your romantic days and nights even better afterwards. 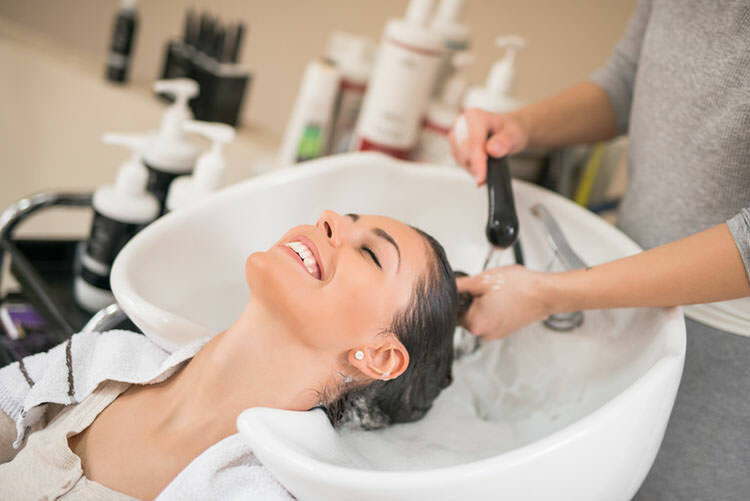 What better way to set up your marriage proposal than by pampering her beforehand? She’ll feel like a queen and will be looking her best when you propose afterwards. You can wait for her in the lobby as she finishes, and when she comes out you can lead her to a nearby beach or garden spot to propose. Or, you can be waiting nearby, and arrange for someone from the hotel to pick her up from the spa. This way, they can bring him or her to where you are waiting to propose. As we mentioned above, many resorts have spa services available. Just be sure to contact the concierge and reserve one before you go. Photography Considerations: If you decide to do this, then please let me know. I have extensive experience in knowing how to capture the day’s events. This way, we can create a wonderful photo collection of everything that took place. The photos will capture all the wonderful moments leading up to you proposing and your partner’s surprise expression. Planning Considerations: plan ahead, hotel help. When it comes to simple proposal ideas, writing romantic proposals in the sand may be one of them. A message in the sand may eventually be erased by the water, but your partner will remember it forever. However, it is still very amorous and something that will get your heartfelt message across. This can be revealed to her in a number of ways. You can walk along the beach and discover it together. Or, if your room opens up to the beach, you can write it in the sand outside your windows. Just open the curtains and then lead her to the extra-special view. Haciendas create a naturally beautiful setting for a romantic marriage proposal. These historical and elegant pieces of old-world architecture are rich in culture and romance. Their Eden-like design included a beautiful pool in the center of its colorful walls. They are also often filled with plants and flowers as well. Engagement and wedding photos look amazing against the backdrop of bright colors, charming architecture, and plant life. 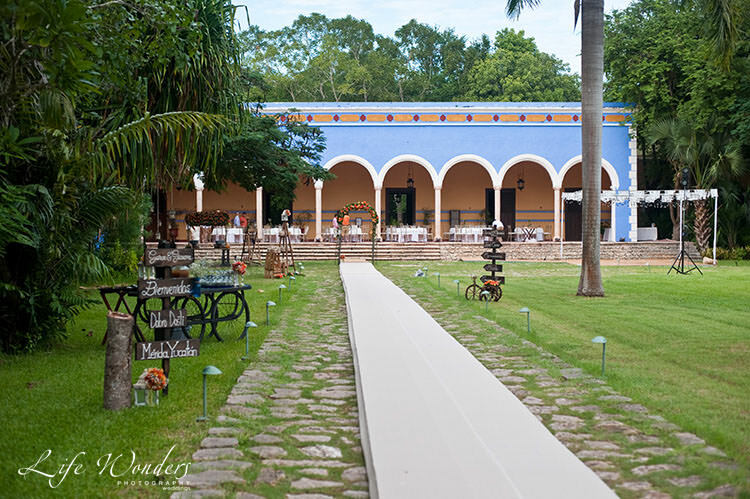 Have a look at this breathtaking Santa Rosa Hacienda which Gio and Goran used for their wedding. 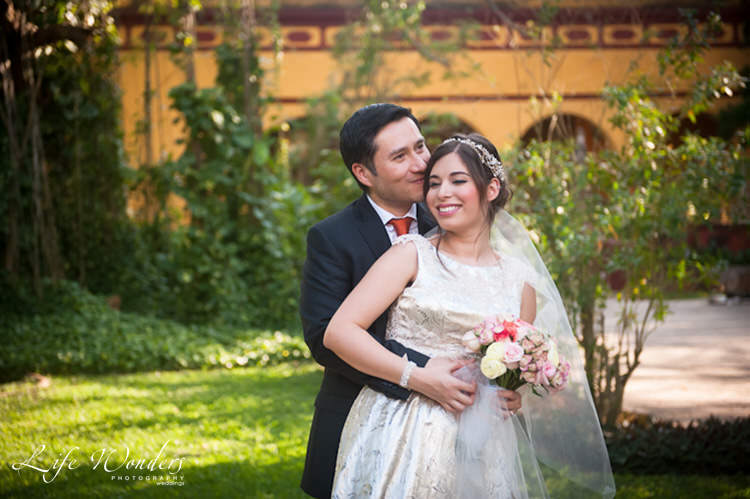 Haciendas are not just the perfect spots for weddings. They will also deliver amazing engagement photographs. Contact me if you need help finding the best hacienda for the perfect wedding proposals locations, I will gladly assist you in any way that I can to help you set it up. 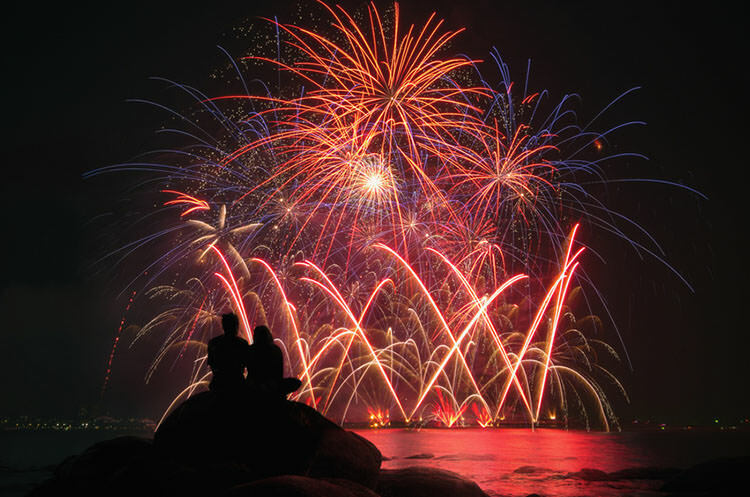 Organize fireworks to be set off at a certain time make the show the backdrop to your romantic marriage proposal. Fireworks at the beach or in the background, provide the perfect setting for a proposal. I can connect you with several party planners and venues. That way, they can help you set up this dazzling engagement surprise. Set up a private adventure tour just for the two of you, and then propose along the way. Go for a pretty hike, try a zipline, explore a cenote or rent ATV’s. You can also try an underground river walk, go spelunking, cave diving, or check out some awe-inspiring ruins, such as Chichén Itzá. This is a great opportunity to have clever ways to propose in an unforgettable, unique location. Be sure to book ahead, and when you do, talk with your tour operator and explain that you want to use this adventure as an opportunity to propose. Ask them for their suggestions and help–many would love to help you make this a one-of-a-kind experience. Photography Considerations: For example, if you choose an underground river walk, they can tell you about the hauntingly beautiful and picturesque areas. Your tour guide can shine a light and illuminate the two of you as I take photos of the incredible journey and your creative marriage proposal. 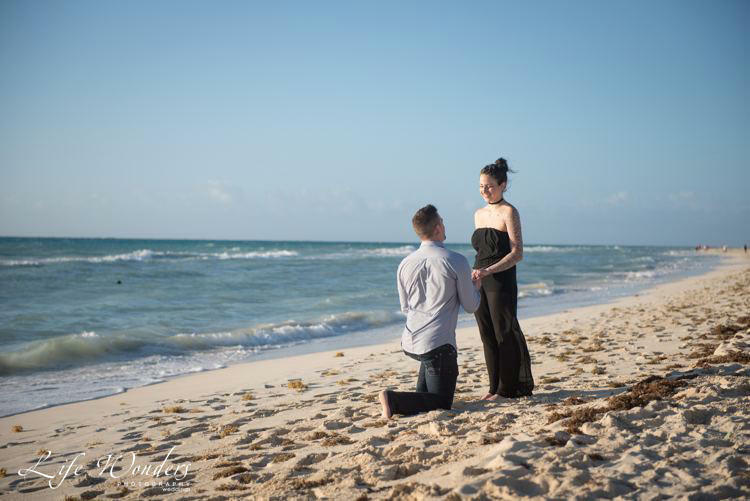 If you have a hotel room in Cancun, that can be the perfect place for an intimate romantic proposal. Feelings could never be captured in a photo. But the kiss that made those feelings come alive can. You can arrange to have the room set up with candles, flowers, and champagne while the two of you are away at dinner. If not, you can do it yourself while you she’s at the beach, shopping, or exercising. Slip the ring on her finger while she’s sleeping. Have fruit, flowers, or champagne near the bedside and then gently wake her up to one of the most special mornings of her life. Talk to the hotel concierge before you go, so that they can help by securing and delivering fruit, flowers, and champagne for your engagement surprise. Order champagne, dessert, and flowers from room service and arrange to have the box holding the ring hidden under one of the silver platters. If your room has a nice patio or terrace, you can set up your romantic meal outside with beautiful views. As a bonus, I can be carefully positioned near your patio to capture the moment when she discovers the ring and you make your marriage proposal. Remember to talk to your concierge and photographer ahead of time to set it up and make sure everything goes smoothly. Create or buy a fancy gift basket filled with things like dark chocolate, fruit, and wine and hide the ring and its box among the treats. Say it is a gift from the hotel, and as she digs in, she’ll find the ring. Again, call ahead and talk with your hotel to see if they offer gift baskets or if they can help you make one. 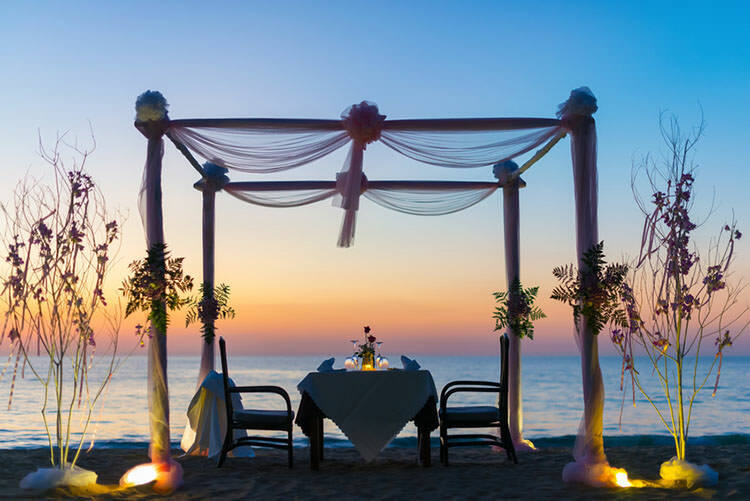 Many hotels can help set up a romantic wedding proposal surprise for you by organizing dinner on the beach. You can also write a message in sand. Nothing is more romantic than a beautiful proposal message written in the sand! You can also add thoughtful touches like flowers and music. 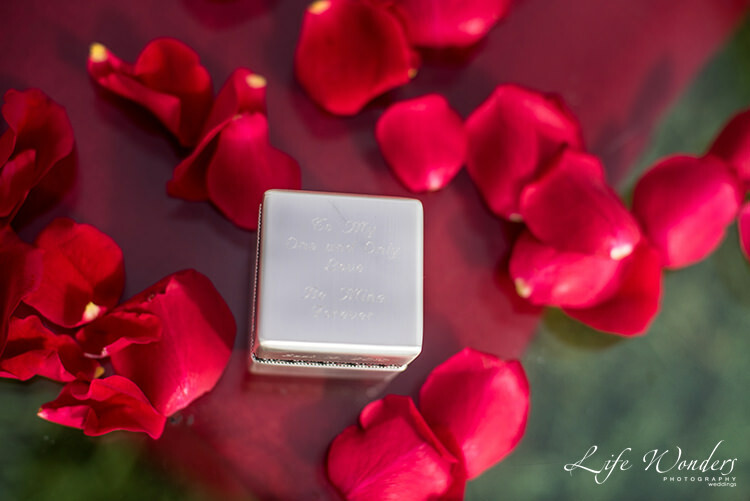 This tiny box contains an object that will change the lives of two lucky people forever. Plan ahead with the organizer from your hotel of choice. This will guarantee a memorable proposal you will both never forget. Proposing to your loved one should be done when the time is right. One of the best moments to do this is while you’re on a beautiful vacation together. Just remember to keep the ring with you at all times until you feel the right moment arise. Once you feel it within you, get on one knee and ask the magical question. Planning Considerations: have the ring, trust yourself and your instincts. When it comes to the best times to propose, the time of the year you choose to so depends on you. It is also best done for when you are ready. However, if you want an ideal beach wedding engagement, there are a few things to keep in mind. If you want excellent mood lighting for your romantic proposal, the best time of the day to do is in the morning. Or at least one or two hours before sunset. This is even more important for those that want unforgettable and magnificent photos for the occasion. Have a look at my in-depth Ultimate Weather Guide for Your Cancun Wedding , which describes the weather in the Riviera Maya for all seasons and all events. When it comes to surprise marriage proposals, it is important to present your partner with something special when you do so. An engagement ring is ideal, but another piece of jewelry can also work. This tradition holds so much symbolism that it would be a shame to ignore it. If you would rather pick out an engagement ring together with your fiance, you can also “rent” a ring from a jeweler. Many allow their customers to use a proposal ring. This way, you can present a beautiful ring when you propose, and later, you can share the experience of finding the perfect engagement ring together. This can also work if you simply don’t want to risk taking your ring on vacation. This option allows you to either rent or buy a ring and use it as a symbolic ring when you make your marriage proposal. 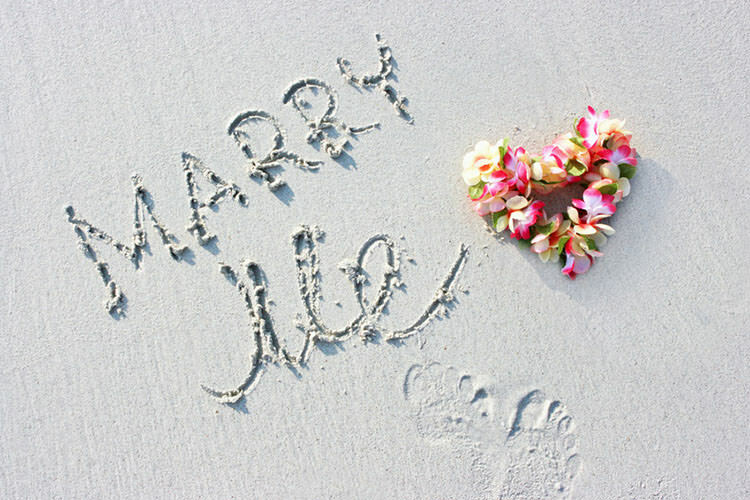 Don’t wait until you arrive at your beach destination to plan the specifics of your propose engagement. You will have an easier time if you do the research ahead of time to find the perfect locations. Be sure to give yourself more time than you think you may need. We recommend making reservations at least 3-4 months in advance. In the event that you are going to have it done during the busy season, then you should do so even longer ahead. While this may require a little bit more effort to plan your romantic marriage proposal from afar, it will be well worth it. After all, if you both arrive at your destination, and you begin running around secretly making plans, your partner will be able to tell that something is going on. Make your planning a little easier by taking advantage of the services that your hotel staff offers. Not only has the staff been trained to assist with these types of requests, they also have hands-on experience with a variety of creative proposal ideas. If you need help coming up with ideas, let our top 25 Romantic Ways to Propose ideas above inspire you. 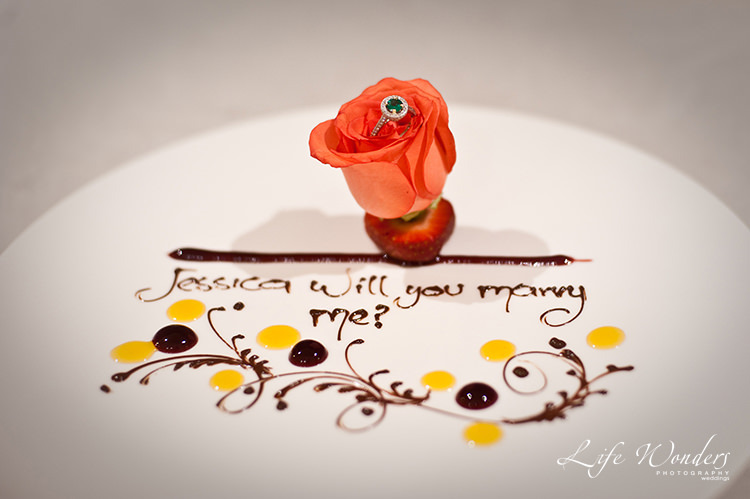 Do you plan to propose in your hotel room or a at a romantic dinner? If so, then talk with the hotel concierge to make dinner reservations. It could turn out that he or she may recommend the best beach spot for a sunset marriage proposal. If you start getting overwhelmed, just keep it simple. Remember, you are already on vacation in a gorgeous location, and because of that, it’s hard to beat a beach wedding engagement. One small detail that can make a huge difference – remember to add flowers if you can. Everyone loves receiving fresh flowers, and they definitely set the mood for a romantic marriage proposal. Your selection can be anything from a simple bouquet to large exotic arrangements. Whatever you choose, will ultimately have a positive impact. Your hotel concierge can help you find a florist that fits your needs. The moments of your romantic ideas to propose are something you want to be captured beautifully. I help couples make this memorable occasion go smoothly. At the same time, I make sure I end up capturing all the special details. For example, the look on their faces when when they realize what is happening, is a moment not to be forgotten. The best part about is that you can use the photos for wedding announcements. You can also use them as a surprise wedding-day gift and as meaningful memorabilia that you will treasure for a lifetime. I have worked on several surprise marriage proposals with photos that you can see here. My experience in being part of so many beautiful weddings and engagement proposal ideas, has taught me to know what may or may not work. Plus, once my team and I hear your ideas, we can even help you make them a reality so your dream proposal can come true. If you feel overwhelmed or concerned, do not worry – I do this everyday and can help you create a very special memorable event. Just contact me, tell me your ideas and we will set it up. 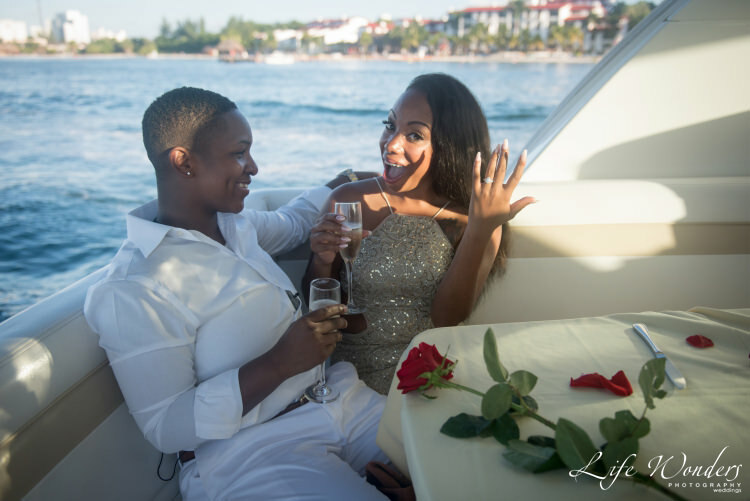 Nicole had a surprise marriage proposal on a yacht and Joi had no idea! She was in tears and the surprise was a success. “Yes, we are now engaged” is the message told by Joi as she proudly shows off her engagement ring. 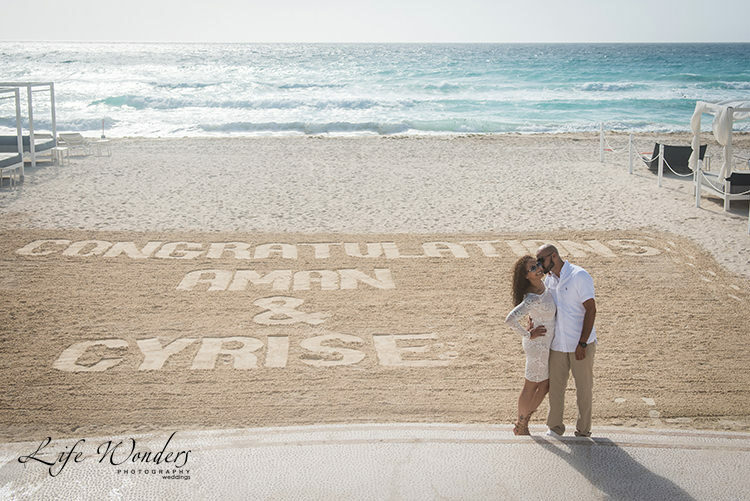 We had such a fun day together, and as mentioned above, their Cancun engagement was featured in HowSheAsked.com. “I can’t stop talking about the wonderful services and engagement photos we received from Dorota. We are very happy and pleased with all of our photos! Dorota has excellent communication. She answered all of my questions before we arrived in Cancun and kept us updated after the shoot when we returned to California. Her professionalism and kindness is what I truly appreciated. She arrived to the location on time and was ready to work. She was more than what i could have asked for. Valerie and Victor wanted a fresh garden background for their Cancun engagement session, as well as some photos from around town. True love just makes every couple want to dance with each other. They also wanted to capture all facets of their relationship–the fun and the romance. You can really see their personalities and love for each other in their photos. Here is Olga’s radiant beach wedding engagement. 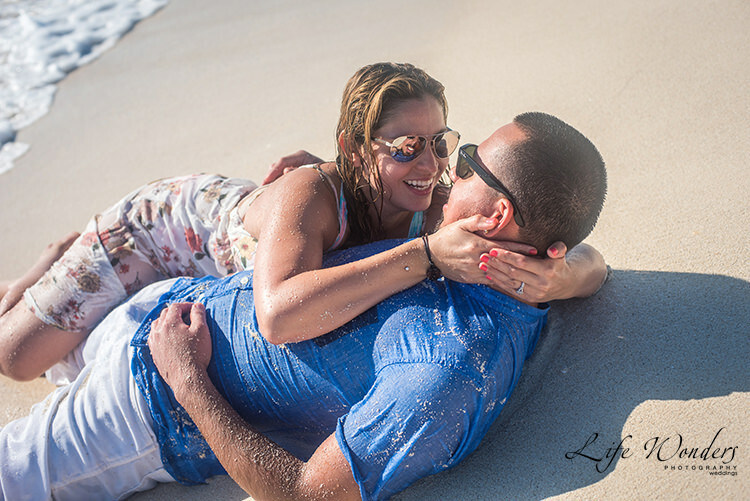 Her and her partner wanted a romantic couple’s session similar to a trash the dress session, we did exactly what she wanted and captured them at Cancun beach. We all loved it! Be sure to bring a nice set of clothes or your good suit and get a haircut. If you look your best, you will feel your best, and your confidence will shine through. Not only that, the love of your life will definitely notice and will really appreciate the effort. If you need help deciding what to wear (or what is most comfortable) for your beach wedding engagement, have a look at my article on Mexico Beach Wedding Groom Attire. I provide tips that will keep you comfortable while looking great, no matter what time of year. You can plan this yourself or get some help. I believe the time you spend figuring out all the details will make you appreciate it more. Your partner will be impressed and you will be so proud of yourself when you pull off this amazing feat! If you do not have the time to figure all the details out or the event you plan is more complicated, then the help of a professional planner can help ease the burden and streamline the entire process. I can connect you with some great event planners who will be happy to assist you. 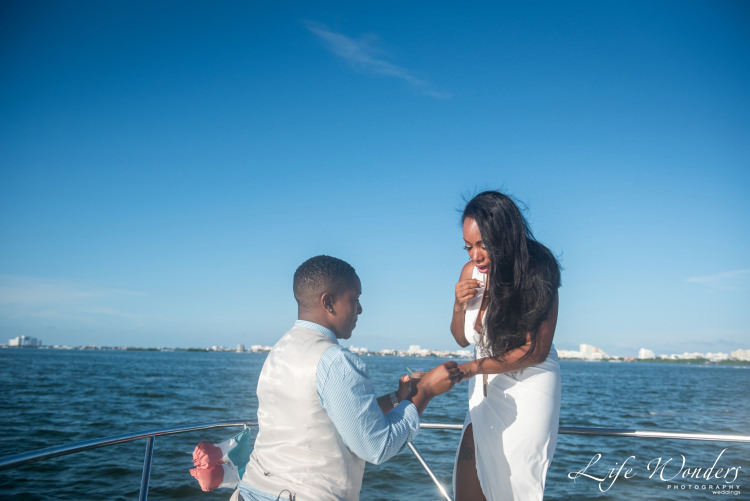 If you are interested in getting a little assistance, email me at info@lifewondersphotography.com and I will connect you with an experienced proposal planner. For the best experience, please remember to include all your marriage proposal ideas, details, and contact information. You don’t want your special and creative proposal to be ruined by airport security nor by accidental discovery. Be sure to pack the ring properly. If you’re flying, do not carry the ring in your pocket as you will have to remove it when you walk through security, and to be safe, don’t put it in your checked luggage either. The last thing you want is your wedding engagement to be ruined because of lost baggage! What you should do is hide it in your carry on luggage, and be sure to fill your bag with unflashy items like clothing and books, not toiletries or electronics that might trigger a more thorough (and revealing) search. For extra security, consider insuring your ring before you go to protect against any loss, theft, or other mishaps. A hidden box among goodies or dessert is one thing, but burying a ring in a slice of cheesecake can be dangerous. Also, leaving an expensive and elegant piece of jewelry in food is not only a choking hazard, a dessert mix-up can further ruin the special surprise. Unless your marriage proposal idea involves her friends and family, try to tell as few people as possible. They may be able to give you some tips, but the more people you tell the greater the chance of someone letting it slip and ruining the greatest surprise of her life. It will also be a joy for her to break the good news to her loved ones, so let that raw excitement and happiness be enjoyed naturally. Think about what you are going to say, but don’t worry if you are not a natural poet. If you have a hard time finding the words, think back to the conversations you had with your friends or parents once you knew that she would be an important person in your life. Look into her eyes, tell her what you love about her, and tell her you want to spend the rest of your life with her. Resist bringing a written speech, as it can be awkward reading from a piece of paper and feel forced. Take it slow, don’t forget to breathe, and if you shed some tears, don’t worry, this moment is meant to be touching and unforgettable. “We absolutely LOVED working with Dorota. Prior to our visit we set up a call with her and told her our expectations. I also shared some of my Pinterest inspiration with her. I was a little nervous hiring a photographer from another country (we live in USA) but I shouldn’t have worried at all. On the day of the photoshoot she arrived on time (we had a little issue with our hotel but that was not her fault at all). The whole experience and the photos she took were amazing. She posed us for every shot and made us feel very comfortable. The day you propose may be just one day in the rest of your lives. Whatever you decide, I know it will be special, wonderful and perfect for the two of you! And I wish you a lifetime of love and happiness. A flower and a ring… will you marry me? Is the message that it brings! If you have any questions or need some basic advice, contact me I will be happy to help. I have assisted many couples to make this a fun, exciting and memorable moment in their lives. Please do not hesitate to contact me. I would love to hear how you met and what you want to plan for you special sweetheart.